Shortly after signing those closing papers and getting the keys to the modular mansion I (Lynn) attended a nearby permaculture convergence. I had heard the term permaculture before (the ashram where I attended yoga school also offered permaculture courses) but I wasn’t quite sure what all it encompassed. The two day event offered 1-2 hour topics ranging from worm composting to grey water harvesting to foraging for edible weeds in your own back yard. I was able to gain a greater understanding of the lifestyle and farming methods as well as meet local people who are already embracing permaculture principles. There will be lots more on that in future posts. Since our move in date was June 13th and we had a few things to coordinate for the move-in, we decided to hold off until next year to put in an official garden. First on the list was to get our scant belongings out of storage in California. When we first hit the road in 2012 we got rid of nearly everything we owned except for a few pieces of handmade furniture, Clark’s dream couch and a few momentos that we decided to keep since we had room in our storage container. “Rent” on the unit was cheap enough to justify a few years of payment and, now that our house is at least partially furnished, we’re glad we kept it all. At least we have somewhere to sit and haven’t had to go into debt to do so. We also got our ATV’s shipped from South Dakota, where a good friend was taking care of them in exchange for their use. Since we have a couple of acres to take care of it’s nice to be able to hop on an ATV and go from one end of the property to the other. We have irrigation rights so checking on the water flow several times a day isn’t uncommon. And, since we live on a county road it’s perfectly legal to ride our ATVs to other farms and public land access points making it slightly more fun than using the Jeep all the time. Wooohoo! Some of you may wonder if we will get bored being stationary, if the itch to travel will creep up or if we might regret (or feel “over our heads”) with our decision to get off the road. So far, it’s a resounding no to all of that. We don’t have time to be bored, the scenery and seasonal changes are so dramatic that we don’t feel the pull to find something more “exciting” or “better” or “new” and there is no regret…it feels utterly and completely right to be here at this point in our lives. 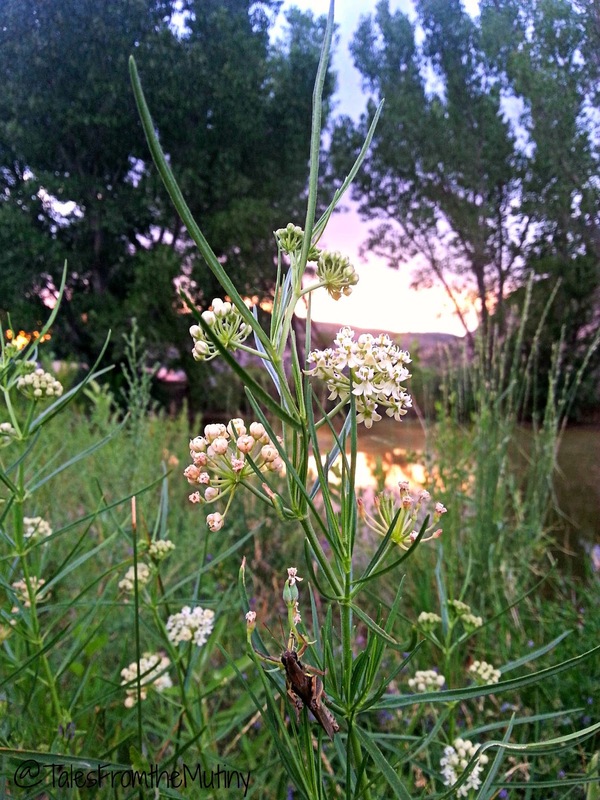 Milkweed blooming near the pond. 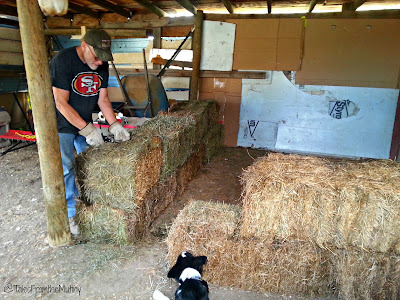 Stacking bales to build a chicken fort! Hay Fort Chicken Coop: Although our new home needs a complete makeover we got the crazy idea to obtain a few chickens in the hopes of having farm fresh eggs every morning. One thing I detest is buying eggs at a grocery store where “cage free” doesn’t mean anything other than a steep price and consumers are duped into thinking their doing something good by purchasing eggs from “hens fed a vegetarian diet only” (all chickens are omnivores and, given free range, will dine on grasshoppers, fly larvae and other “meat”).But first, we needed a coop. I contacted our new neighbors scattered along a 20 mile stretch of rural county road and asked if anyone was selling mulch hay or straw. Within two days we had 36 bales of free hay (half of which were feed quality) and we set to task on building a hay bale chicken coop for our future flock. Inspiration came from the straw bale housing movement along with Andy Lee’s book Chicken Tractor: The Permaculture Guide to Happy Hens and Healthy Soil. Heckle and Jeckle in the chicken tractor. Chicken Tractor: Permaculture utilizes systems that work together for the benefit of all involved. 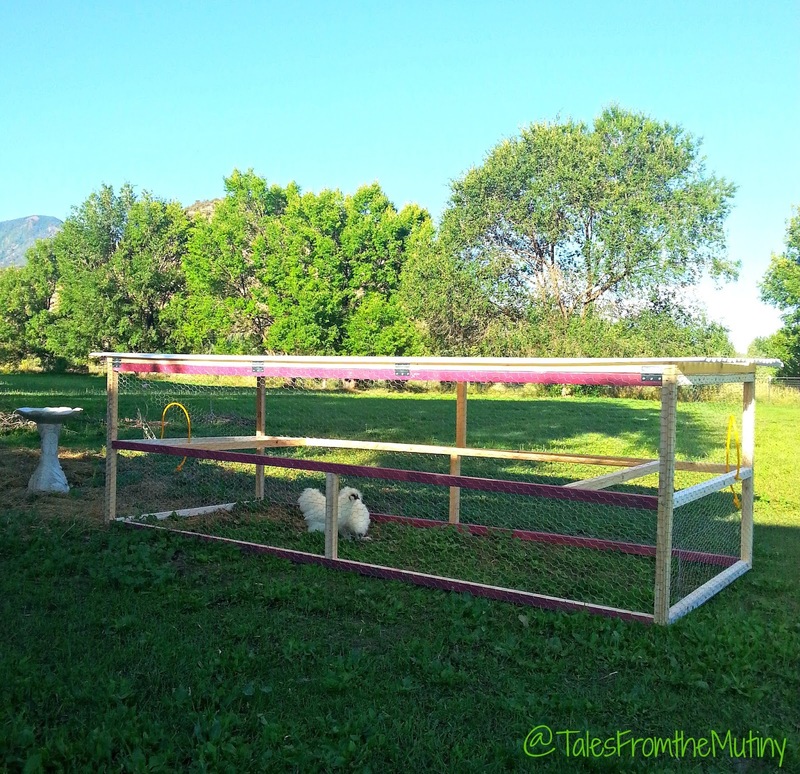 In the case of the chicken tractor the idea is that you can enclose a specific area where you want your chickens to fertilize (poop), till (scratch and eat plant matter) and control pests (eat harmful insects like grasshoppers) while getting sunshine, “free” food and protection from predators. We get weed and pest control, spend a tiny bit less on chicken feed, reduce the labor to add fertilizers (and eliminate the need for synthetic fertilizers) and get eggs for Clark’s breakfast. The chickens are happy…even ecstatic…when they get to go into the tractor. The ground is prepped for garden planting without much effort at all. Chickens!! : We follow a few local Facebook groups set up for people to sell or swap pretty much anything. There are people posting llamas for sale, cars for trade, requests for people to buck hay and some looking for pasture to graze their sheep. 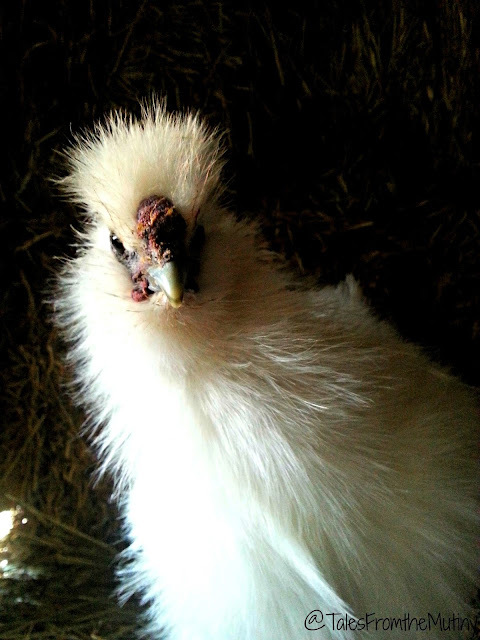 Well, we found someone selling two white Silkie hens, which we bought that day. The next day one of them started crowing (like a rooster…because it was a rooster). A week later the second one started crowing but we were already attached to them. But we wanted eggs! 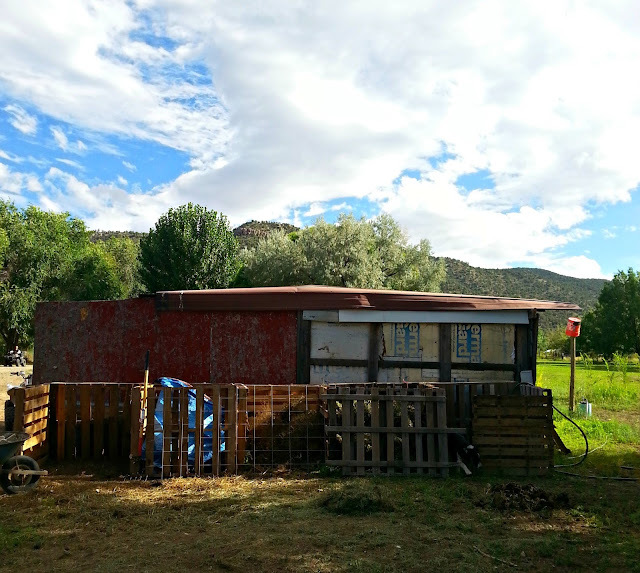 So, I sent an email out to our neighbors up and down the canyon and soon obtained two beautiful laying hens (they were gifted to us as a “welcome to the neighborhood” gift). And now we have eggs! Worm Composting Bin: After watching a demonstration at the Permaculture Convergence I felt like this was a project I could easily make without much effort. It’s taken some trial and error, but I think it’s going well (at least my worms are still alive!). A very helpful book is Worms Eat My Garbage. We expanded our 3 bin to a 5 bin system. The center bin is a passive bin (throw stuff in and forget it for a year or two) while the outer 4 are hot compost bins (active bins maintained to keep high temps resulting in a finished compost in about 3-4 weeks). Reclaimed Pallet Compost Bins: A top priority for us was to establish a compost pile as quickly as possible. It’s something I wish we had been able to do while traveling fulltime because #1: throwing out organic materials (like food scrapes, egg shells and vegetable peels) is extremely wasteful and #2: without those items in your garbage bin there’s virtually no odor, no need for plastic garbage bags and it takes longer to fill (less trips to find a dumpster). Plus, we’re making soil now! We feel like we’re a part of nature now…not just robbing the land for our own benefit, but contributing to the health of the soil, the microbes, insects, air and water. (Note: We got all of our pallets free, simply by asking the local hardware stores). Recycling Storage Center: Now that we’re stationary we can easily recycle the things we can’t compost. Sort of. Our town’s waste management facility doesn’t currently offer roadside recycling service (there are plans to incorporate it in the near future) so we have to physically take our stuff into town…and it has to be separated. They also only accept #1 and #2 plastics so we’ve had to be more aware at the point of purchase to *try* to ensure if we have to buy something in plastic that it can be recycled (or reused). Case in point, I recently changed shampoo brands because my old shampoo containers are plastic #6. Anyway, we have 5 separate bins and Clark has been working on an amazing storage area for them in our sunroom. Photos coming as soon as it’s painted! The first hugelkultur bed we built using tree branches we gathered on our property. Large beds are often dug several feet down and filled with full sized trees. The idea being that each layer gets a finer material (trees, branches, woodchips, straw or hay, soil/compost, cover crop) and, as the wood decomposes the ground becomes a sponge and rarely needs watering. Hugelkultur Garden Beds: While it may sound intimidating, a hugelkultur bed can be one of the easiest methods for creating raised beds that hold water like nobody’s business. Basically, it’s a garden bed made from decomposing wood, layered with other organic materials like newspaper, hay, straw, wood chips, etc. They can be made utilizing any size trees, or branches, you have available. 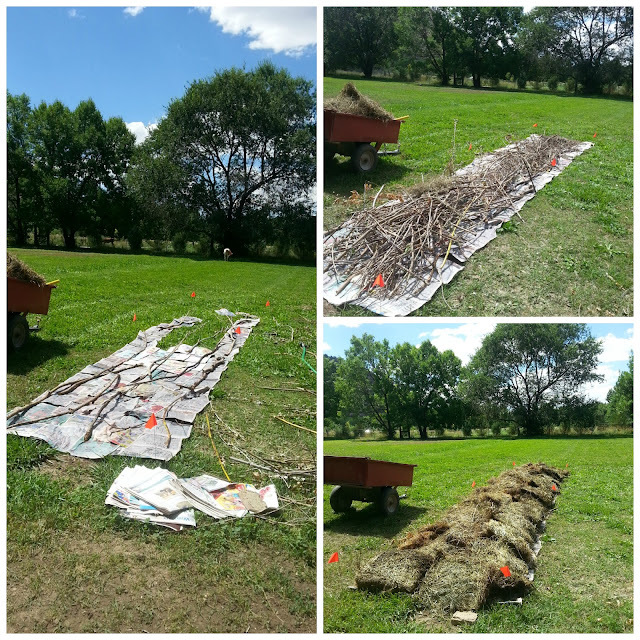 My friends at the Provision Project are building a huge hugelkultur with full sized trees while my three beds are made from tree branches and wood chips from our tree pruning. These beds are pretty much self-composting piles that will only become better with age. We’ll keep you posted! There are plenty of books on the subject but Edible Landscapes With a Permaculture Twist helped take away my fear of making these beds. 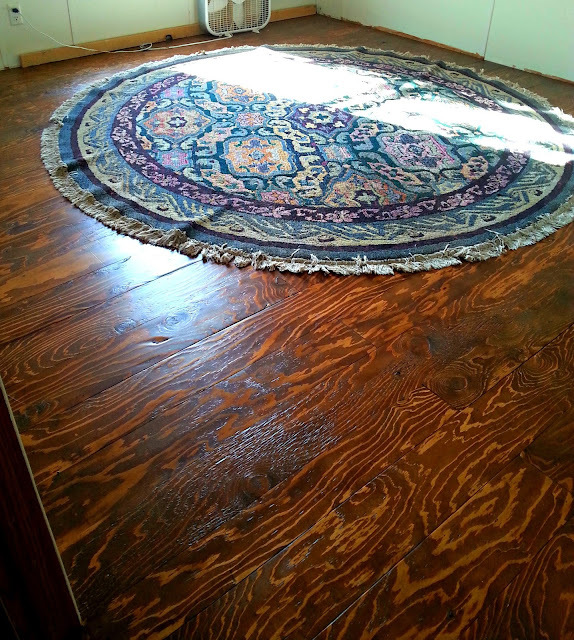 Our plywood planked flooring purposefully rustic, made with our own hands, installed with love (and a lot of nails). Plywood Plank Flooring Project: Now that we’ve moved from less than 300 square feet of living space to just over 1500 (holy moly, it seems huge), we realize there’s going to be a lot of flooring in our future. This house needs a complete remodel…old carpet removed, walls painted (at the very least), counter tops replaced, etc. Since I love to read other people’s blogs I found a unique concept to make our own planked flooring for slightly less money than manufactured flooring which gave us the farmhouse look we desired. It’s plywood plank flooring. Basically, you take 4’x8′ sheets of plywood and rip them down into 6″ (by 8′) planks, attached to the subfloor, sand and then either paint or stain them. We decided to use one of our spare rooms as a testing ground and are (so far) thrilled with the results…even if it was a lot of work. Benny: If you’ve been following our blog for a while you’ll notice a trend…we like to adopt dogs at the most inopportune times. We adopted Nellie a week before we crossed the Canadian border for our Alaska Adventure last summer. 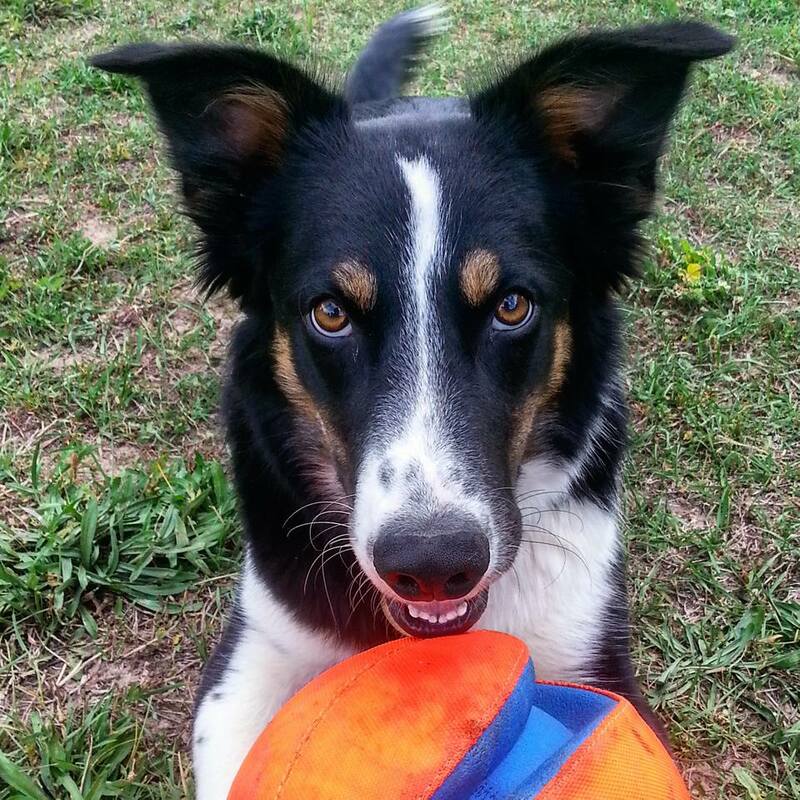 Well, we got another wild hair and adopted Benny the Border Collie a few weeks after moving into this home…because, there’s nothing like dealing with a 5 month old, highly active puppy while trying to remodel, build stuff and settle into a place. Hey, who says we’re not living on the edge now that we’re not traveling? He’s been a great dog…challenging at times, but really great…and super cute. In case you’re wondering, Nellie loves Benny and is finally learning how to be a dog and play. Avi, the male, grey cat also loves Benny and they hang out together often. Miso, the calico cat, thinks all dogs are dumb. Getting to Know the Area: When we’re not working on projects (or resting) we try to get out and about meeting neighbors, checking out local stores, finding hidden gems and generally trying to get to know the area. We’re surrounded by National Parks and Monuments. 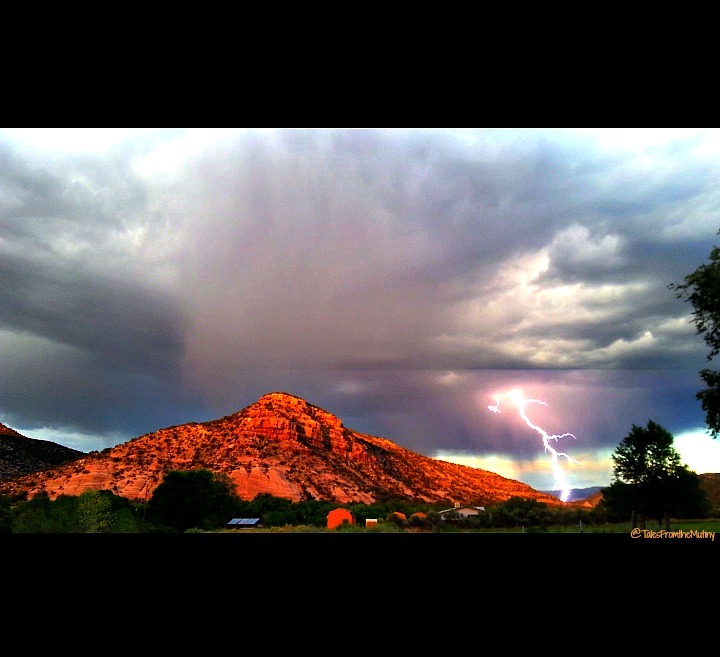 There’s plenty of hiking, biking, rafting, fishing, ATVing and outdoor activities all around. There’s also more local resources than we had first thought. Part of moving to this area was so we could focus on growing our own food and sourcing local products as often as we could. We’ve now learned that there’s a flour mill in town, a corn mill in the town just to the south and a milling company in the town north that sells dried beans. There are two small wood mills with locally sourced wood (and wood chips). There’s a plethora of local breweries as well as distilleries and coffee roasters. Our town offers a Farmer’s Market all summer (there are two others within a few miles of us) as well as a winter market at a local greenhouse/nursery. Colorado grown (or made) products are proudly labeled and sold in most stores. The sense of community is abundant here…and it makes us even more sure of our decision to live here. Learning to forage these all came from our property one morning. 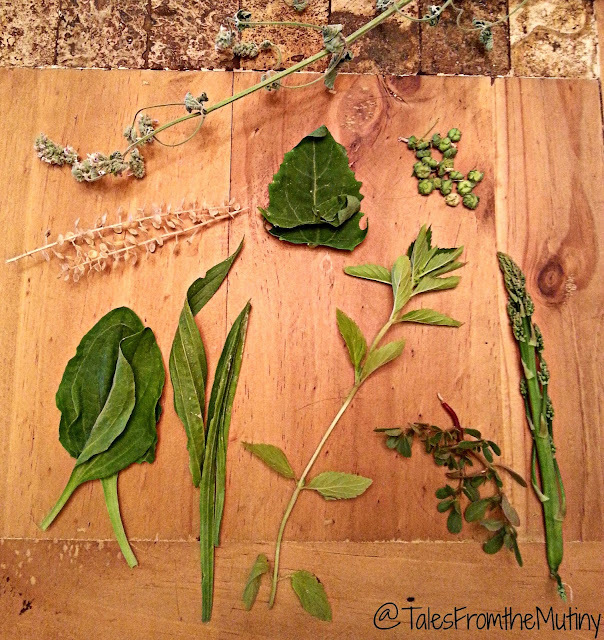 Top: Cat Mint, second row (l to r): mustard seeds, goose foot (aka lamb’s quarters), mallow fruit (aka cheese wheels), bottom row (l to r): broad leaf plantain, narrow leaf plantain, field mint, purslane, wild asparagus. Getting to Know Our Land: We’ve harvested cherries and blackberries as well as foraged for mint, purslane, dandelion and mallow. We’ve picked peaches at one neighbor’s house and pears at another. So, some days have been spent pitting cherries, slicing and drying various fruits, make jams, homemade ginger ale and kombucha, baking bread from locally sourced flour and pies from our own apple trees. Soon we’ll be harvesting hundreds of these apples and figuring out to do with all of them. The learning never stops and neither does the thrill of eating our own foods. Next year we hope to have a few garden beds planted with annuals (tomatoes, peppers, corn, melons, etc). Looking over this list it seems I’m missing so much! Everyday is an adventure and seems to bring a surprise. The biggest struggle so far has been dealing with Internet (something that most fulltime RVers can empathize with). Because we’re so far in the canyon we have limited options. So, I’ve put off updating the blog for fear of using up all of our limited (and crappy) Hughes Net gigs. But, everything is happening so quickly that I want to stay on top of all the changes here. Thanks for coming along with us on this new journey! WOW! We also have a base, but RV from there for our adventures. Your base is an adventure! Thanks for sharing your new life with us, a great decision for you and new adventures for the rest of us. What a fabulous new adventure! I think it would be so fascinating to have your own homestead. So much to learn and do. I can't imagine that you'd ever get bored. Looks like you are having a WONDERFUL transition to sticks and bricks! I'm so glad you posted, I love watching you settle into your land. I hope you continue to post occasionally, this style of living resonates with me. Thanks so much! It's fun to be newbies again. I think this will help keep us young! Enjoy your RV adventures. We're very excited and learning so much. Next spring should be interesting as we try to figure out our garden! Thanks Lisa. We are still in love with this place and have big goals. I hope to post more often (hopefully we have this Internet issue resolved). You've picked one of our favorite parts of the world. 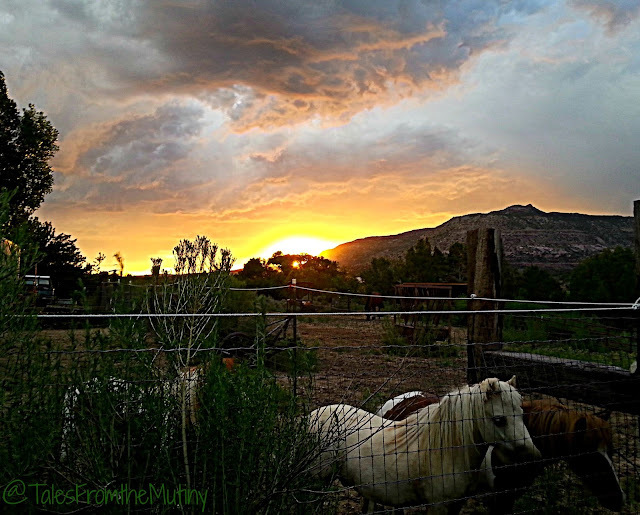 As full-timers (10 years), we return to Cortez, Mesa Verde, Pagosa Springs, Durango, as to home. I love Barbara Kingsolver. Animal, Vegetable, Miracle is an amazing work to which I refer for all kinds of reasons – practical and spiritual. I'll be enjoying your farm blog, as we get back on the road after 5 years of being (mostly) in one place (to look after MIL). The home base has become the Olympic Peninsula of Washington – rural, organic, great farmers markets.